The Ostional community guides spent the weekend at Las Galerias Mall in Managua to share their story and to promote Ostional as a tourism destination. Guided tours range from bird-watching hikes, to sea-kayaking trips. All guides (first four young women on the left) are young members of the local community. 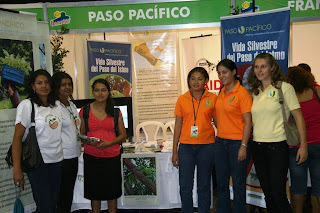 They are proud to know that they will benefit from ecological tourism.